What happens while we sleep? What happens to our brain? Are dreams manifestations of our subsconscious or are they exercises in free association? When director Leos Carax gets up from a bed in the opening scene of Holy Motors, he opens a wall with a key that has grown out of his finger. Carefully he walks through the wall following the sound of ships and seagulls only to find himself in the upper deck of a movie theater. The next shot takes us to the screen, where not a ship, but a modernist house that looks a lot like a boat is presented in all of its glory, with pristine white stucco walls against the vibrant green of a perfect stretch of grass. The transition from the theater to the screen is an example of the playfulness of Holy Motors, a film that is not preoccupied with reason and rationality, but with associations. Leos Carax is dreaming, and like all of our dreams, he is the protagonist in his own illusion. For most of Holy Motors his alter ego, played by a spectacular Denis Cavant, is referred to as Mr. Oscar, a mysterious figure who we are introduced to walking away from the modernist house, waving good bye to his children before he greets the driver of a white limousine and hops in. Based on our own experiences, we subconsciously assign Mr. Oscar the role of the businessman. This notion is reinforced when his driver talks about the “nine appointments” of the day and he receives a call on his cell phone. In the next two hours of film, Mr. Oscar uses his limo as a changing room of sorts, making use of all the props and make-up utensils inside the vehicle. His driver takes him all around Paris and for each appointment he becomes an entirely new character. This is no businessman like we thought, but who exactly is he? Time and time again Carax challenges us to think of reasons of why we are seeing what we are seeing. Everytime we think we have arrived at a plausible conclusion, Carax presents to us something unexpected that both confuses and challenges us to think even more. Each time Mr. Oscar steps out of his limousine anything is possible, from kidnapping a famous model in the middle of a photoshoot to pretending to be an old lady begging for money. There is seemingly no connection between each sequence except for Mr. Oscar, who goes from one appointment to the next with increasing frustration and tiredness. One can analyze Holy Motors as a series of performances, all carried out by the same actor within one film. Each story has a beginning and an ending, self-contained in their own little world. Some are commentaries on society, while others seem to be either repressed desires or even memories from the director. Among them, the sequence between Denis Cavant and Kylie Minogue is particularly revelatory, a compelling short story with none of the comedy of previous vignettes that pays homage to romantic films and musicals. Most importantly, it seems like a more personal sequence, hinting perhaps at the tragic suicide of Leos Carax’ wife just a year prior to the release of the film. Though we may be able to find reason in this one instance, there are some sequences that are completely dumbfounding, riddles that only its author can attempt to solve. When people go to the movies these days they usually expect to find a film with a story, one that is based on reason and narrative conventions. Sometimes movies can be a bit more complicated or, shall we say, unconventional, but no matter what, theatrical feature-length films always have a reason to exist, an intention, a purpose. 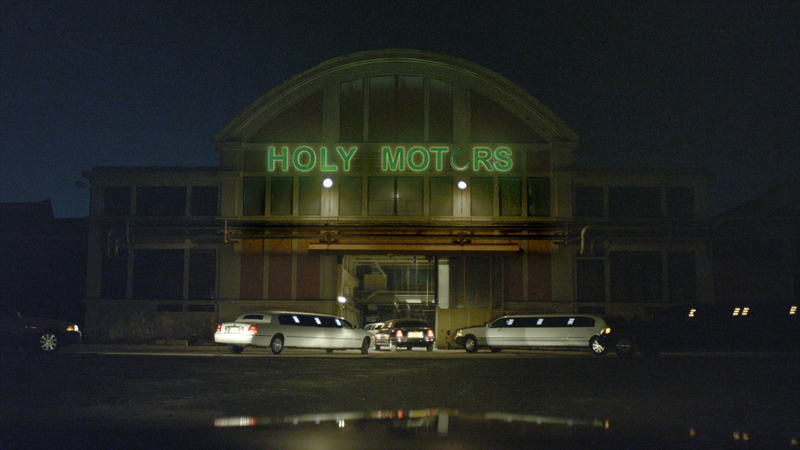 Holy Motors exists in a realm that is all of its own. It defies categorization. To find a purpose, or a thesis statement would be to find yourself immersed in a labyrinth without exits. French director Leos Carax has not made a traditional film, but an experiment in film making, a visual experience so frustrating and so interesting that it can easily be taken as a masterpiece or as a complete waste of time. Either conclusion perfectly understandable. What is undeniable is that Holy Motors is a truly original film that aspires to be more than just a visual tale. This is an experience unlike any other, a piece of art. Hey, I think I gave the same score for this too Niels. It’s definitely a challenging but amusing film but y’know, I enjoyed it for the most part. Some of the songs are quite lovely as well, but yeah, this is not a film for everyone so I get why some people didn’t care for it. It’s certainly one of those films that is not everyone’s cup of tea. I think there’s more appreciation for it from people that are really into movies like we are. Surprisingly, I found it to be both challenging and entertaining, which is a rare combination to get from a film. I’ve been waiting too long to watch this I think – thanks for reminding me of it! I’ll have to be in the right mood though. It’s more entertaining than you might think. Give it a shot.